On a sunny April afternoon, in a town where the Pantego Creek meets the Pungo River, just northwest of the Pamlico Sound in North Carolina’s Inner Banks region, a 70-year-old man on an old-fashioned bicycle glides down a dirt lane, lined with humble homes. He wears a gritty, somehow gentle expression on his tan, weathered face, despite his missing left eye and lack of an upper left jawbone. 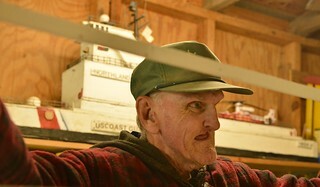 He proudly tows behind him a wagon with a beautiful wooden replica of a Coast Guard cutter he built himself from scratch. The town is Belhaven, North Carolina, an inviting and popular port of call for recreational boaters traveling along the Atlantic Coast. The self-proclaimed “Birthplace of the Atlantic Intracoastal Waterway,” Belhaven is a place where most folks offer a warm, welcoming wave whether they know you or not. You’d likely have to search all day though, to find a local there who doesn’t know Jimmy Courson. In roles he may not fully understand – both as an inspiring, older brother and a source of comfort for a friend experiencing unimaginable loss and grief, Jimmy’s determination, resilience and passion have a tremendous impact on the lives of those around him. 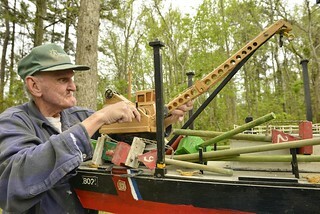 Jimmy Courson operates a crane on board his rendition of Coast Guard Cutter Kennebec in his yard in Belhaven, N.C.
A unique, detail-oriented man with a deep-rooted devotion to creating art, inspired by the rich maritime culture that surrounded him his entire life, Jimmy has called Belhaven home since his family moved there during the late 1940s. 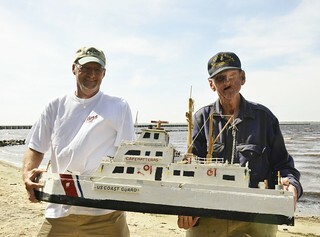 He’s well-known today for his tireless fervor for building model boats, often intricate replicas of Coast Guard ships known as cutters. Jimmy attended John A. Wilkinson public school until his 8th grade year, but because of complications at birth that resulted in his learning disability, he attended a special-needs class for the next three years. 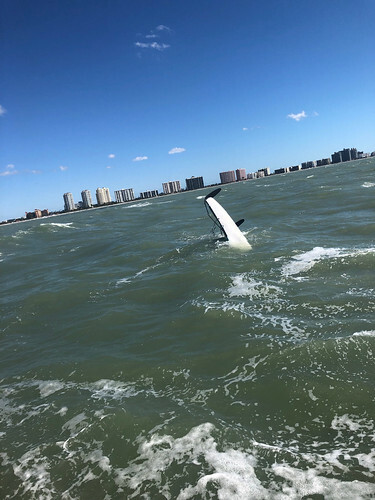 When he wasn’t in school, he was busy building his model boats. 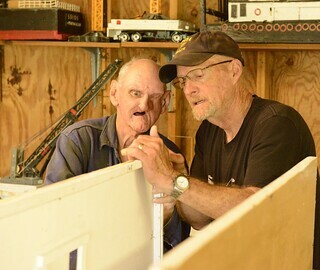 Jimmy Courson (left) and Dave Friedrich work on a model in Courson’s garage in Belhaven, N.C. 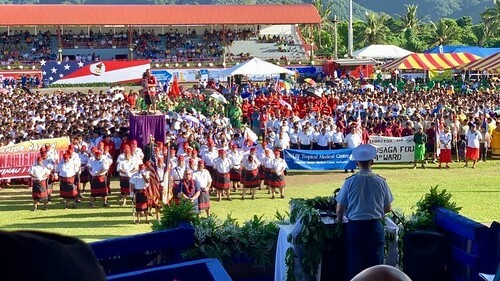 It wasn’t just the cutters passing through that inspired Jimmy – he was influenced by the seagoing military service of his family, his community, the Eastern North Carolina region and beyond. Jimmy’s father, James, served in the Navy from 1919 to 1945. His uncle, Clyde Farrow, retired from the Coast Guard as the last attending officer at the buoy tender station in Washington, North Carolina. 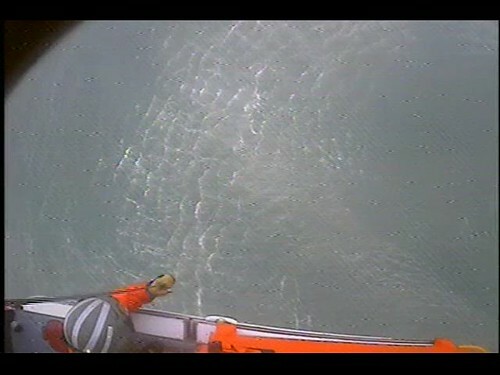 There was also an active Coast Guard Station in Belhaven in the late 1950s and early 1960s. 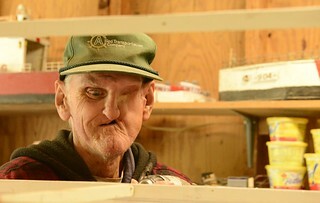 James had an old shed in the backyard, a few hand tools and usually some scrap lumber suitable for making small boats. Reid said many neighborhood kids would make crude boats they could pull in the shallow water on the shores of the Pungo River. 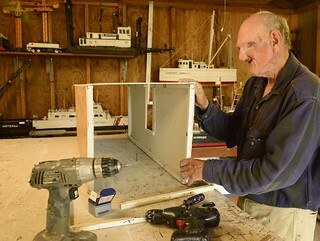 Jimmy took his model building to a higher level by following the design of existing Coast Guard vessels, replicating the operating parts from whatever hardware he could find. 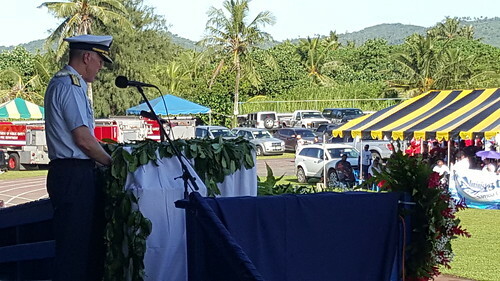 “He really came up with some interesting improvisations, trying to duplicate the mechanics and outfitting of everything from Coast Guard cutters and buoy tenders to shrimp boats and barges,” said Reid. Up until his late 50s, Jimmy rode his bicycle from Belhaven to Swan Quarter, about 28 miles, took the ferry to Ocracoke, and visited with Coast Guard personnel at the station there. He continued on to the Hatteras Inlet Ferry and stayed at Midgett’s Motel in Hatteras Village. 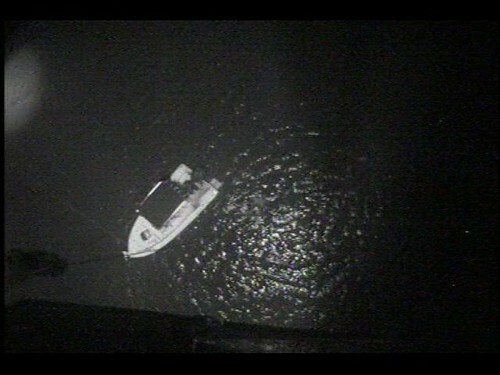 It wasn’t uncommon for him to tow a model boat weighing 10-30 pounds behind him on a wagon. Other Coast Guard stations visited by Jimmy over the years included Fort Macon, Oak Island and Morehead. He was declared an honorary Coast Guardsman on more than one occasion, and has a collection of Coast Guard covers and pins. 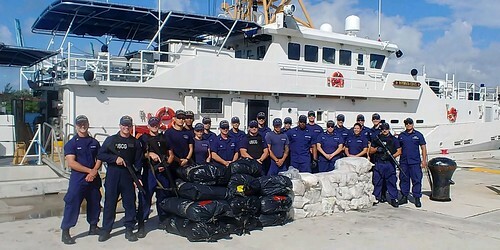 He has several photo albums in his home documenting his unique relationship with the Coast Guard over the years. 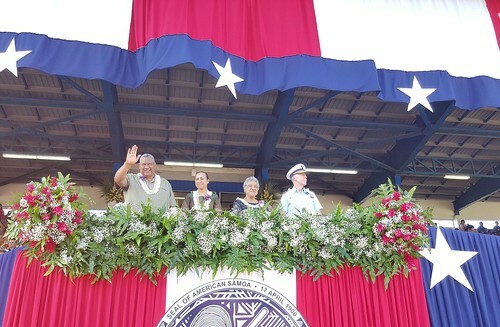 About 13 years ago, his visits to Coast Guard stations tapered off as he began to experience health issues. In 2002, Jimmy told Reid he had been experiencing some bleeding from his gums. These days it is difficult to make out everything Jimmy is saying, but he enthusiastically describes almost any model in his collection if asked politely at the right place at the right time. Though he’s now 70, Jimmy still gets around on his bike, riding across town to spend time on Belhaven’s waterfront. That’s how David Friedrich met Jimmy for the first time. A recreational boater who stopped in Belhaven during a voyage along the Atlantic Coast, Friedrich’s first encounter with Jimmy occurred during an especially difficult time in Friedrich’s life, having recently experienced the death of his son, who was killed in the war in Iraq. The impact on Friedrich was tremendous. He went on to write about it in a log he kept during the voyage. Friedrich moved to Belhaven in 2007. His relationship with Jimmy continues to play an important role in grieving and healing. 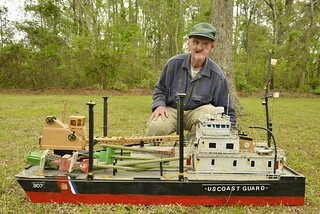 Jimmy Courson crouches behind his rendition of Coast Guard Cutter Kennebec in his yard in Belhaven, N.C.
Jimmy has reached countless people through his art and his determination. Perhaps nobody realizes first-hand what he has been able to overcome more than his own brother.